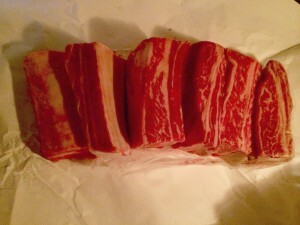 I love braised beef short ribs with big red wine. There is nothing better. Here is my way of doing it. I usually make way too much sauce so I have extra for a pasta dinner on another night. I usually allocate 1 meaty rib per person, but I make a lot extra just in case someone wants seconds. Heat a large cast iron dutch oven and add the vegetable oil. Season the ribs well with salt and pepper. Brown the ribs on all sides. 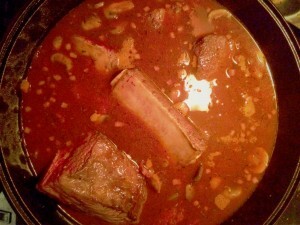 Remove from the pot and set aside the browned ribs. In the hot pot, sautee the pancetta. Add the onion to the pot and sweat until translucent. Add the celery and the carrots cooking until tender. Toss in the garlic and sautee for a minute. Deglaze the pan with the wine and scrape down the bottom of the pan to get all of the tasty brown bits. 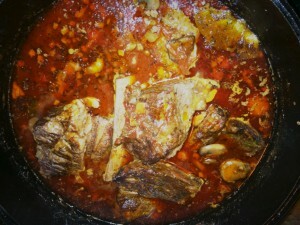 Reduce the wine by half and then add the stock. Reduce the cooking liquid some more and then add the tomatoes. Return the ribs to the pot and add the herbs. You can finish braising the ribs on the stove top for 3 hours on a low simmer or you can put the whole pot into a heated 350 degree oven and cook for about 3 hours or until the meat is super tender. After the meat is cooked, remove the ribs and keep warm. Skim any excess fat or foam off the surface of the cooking liquid. Reduce the cooking liquid to the desired thickness. I like to leave the sauce chunky, but you can always blend some of it to make is smoother. There are a few ways to serve the ribs and the sauce. You could make soft polenta and serve a rib on the polenta with a ladle of sauce. You could be very traditional and serve the sauce on pasta as a first course followed by the ribs with roasted potatoes and braised greens as the second course. 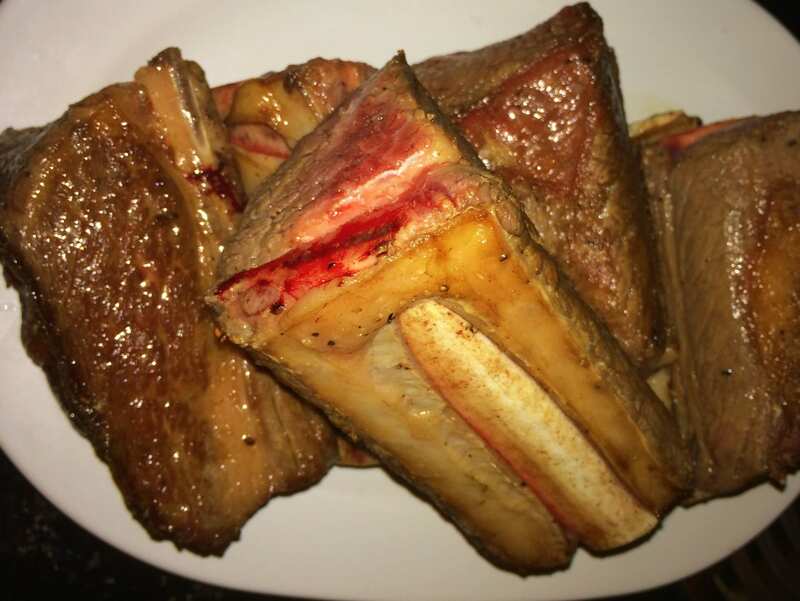 I prefer to go “Fred Flintstone” style and serve the rib, bone and all, but you can always remove the meat from the rib and serve in pretty slices. Enjoy with a hearty Cabernet like the Silver Oak!